Below is a short view which gives you a good over view of the do’s and the dont’s when dealing with emergency vehicles. After the video are the key points. Stay alert to approaching emergency vehicles, you’ll often hear them before you see them so keep the music low enough to hear warning sirens. Keep an eye on your mirrors too. When you hear the sirens or see flashing lights, try to locate the vehicle and consider the route that it may take. Take any appropriate action to let it pass, but be careful not to contravene any traffic signs or rules of the road. Remember: Emergency vehicle drivers are specially trained and have exemptions to the law that you don’t have, so you must not go through red lights or speed to allow them to pass. Don’t panic or brake suddenly. This could slow the progress of the emergency vehicle, and put yourself and other road users in danger. If you are able, pull over to the side of the road, indicating beforehand and keeping any eye out for pedestrians and cyclists. However don’t pull over on or near to a hill, bend or narrow section of the road. Don’t mount the kerb unless you absolutely have to and, even then, only if you are certain that you won’t put pedestrians at risk. If you are approaching a roundabout allow the emergency vehicle to reach, navigate and leave before you enter the roundabout yourself. If you are about to emerge from a side road, stay where you are until an emergency vehicle on the main road has passed, even if you can only hear it at this point. Don’t take chances, it will be difficult to judge their speed. On a dual-carriageway or motorway you should move over to a nearside lane by signalling your intention and merging with vehicles already there. Don’t cut in front of other vehicles, they may not yet be aware of the approaching emergency vehicle. On a road with double white line system, and the line nearest you is solid, maintain a safe speed and do not exceed the limit. The emergency vehicle will remain behind and may turn off the sirens or lights. If you can safely pull off the road, signal your intention and then pull off. Otherwise wait until the white lines change priority, or end, then find a place to stop, slow down or pull over to allow the vehicle to pass, signalling your intention as before. 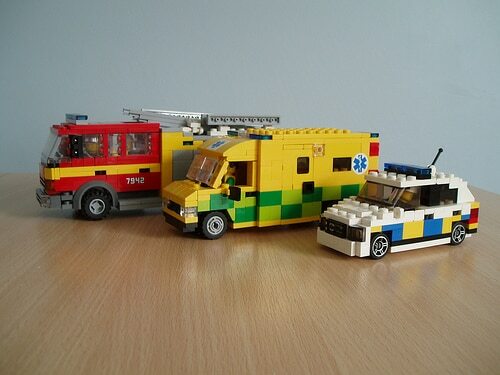 After the emergency vehicle has passed check there are no more vehicles coming before you continue – there may be more than one going to the same incident. Wait until it is safe to do so, then indicate as necessary and rejoin your route. Always remember that while the emergency services do want you out of their way, they don’t want to have to stop to help you if you cause an accident.